Security alarm systems: Do Fresno businesses need them? While we’ve got great weather, diverse cuisine, and easy traffic that comes with a small-town California feel, we’ve also got the big-city problems that come from being the fifth-largest city in the state. For businesses, this can mean theft, burglaries, and robberies. Is a commercial alarm the answer? While alarm systems can’t stop every criminal, they certainly can help prevent certain crimes and they can reduce the damage and risk to property and assets as well as help protect employees. But what does a business need to have in place for a security alarm to be effective? And what kind of businesses should have an alarm system in place? Businesses with valuable retail items such as jewelry or electronics are obvious targets. But Fresno businesses, along with businesses across the country have discovered that they are target for break-ins and outright theft, even when there aren’t obvious valuable items on display.Offices are vulnerable because employees may leave purses, wallets, or laptops in easily accessible locations.Your computers may be old, but a criminal doesn’t know that. All they see is something they can steal and sell for a few dollars. The first versions of burglar alarms in the 1800’s were simple setups that included detectors on windows or doors, which tripped an audible alarm to notify someone nearby. It was practical when business owners lived in or near their business, but if the owner wasn’t home, that “monitoring” system depended on alert (or nosy) neighbors who would hear a loud, ringing bell and hopefully call the police. And when business owners started living somewhere else, or when commercial business districts separated home and work, there may have been no one around. Or maybe the system required someone to physically set it off. You’ve seen it the old movies… bank robbers go into the bank, the teller hits a button, and the alarm goes off. Again, the police still needed to be notified. Basically, an alarm system was only as good as the monitoring. If no one was listening or if there was no one nearby who could take a useful action, then your security was useless. So it seemed to be a great advance when business security systems evolved to include a direct connection between the home or business and an alarm company or even the police department (the first direct-to-police alarm system was invented in 1905). The alarm would ring or some other alert would go to the dispatcher and an officer would be on their way to check it out. But … with over 90% of alarm calls turning out to be false alarms, police departments started charging false alarm fees. And if your business is in the city of Los Angeles, they aren’t responding at all unless the alarm is verified as a break-in or emergency situation by someone such as a security guard! Business owners are left with only a few choices. Be alerted by a self-installed security camera or alarm system, then monitor it themselves, and go out and look if the alarm goes off. If you don’t want to go, you can hire private patrol security officers who can go to the business and assess the situation (we do a great job), but you still have to do the monitoring work and then call your security company. This option (do-it-yourself) is dangerous! And business owners already have enough on their mind keeping them awake at night without having to act as their own security alarm and monitoring service. 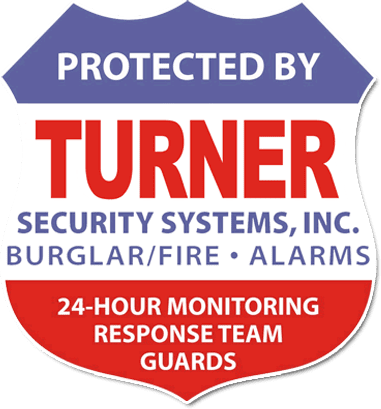 Turner Security Systems has both standing security guard and vehicle patrol service and when added to a business alarm service, we can physically verify signs of a break-in and alert the Fresno police department (or your local police). You can get an added layer of security and a great return on investment with motion detectors and video. Trained security team members in our state-of-the-art dedicated monitoring facility will be able to actually see if someone is in your business and can report this to Fresno, Clovis, Madera police or your Central Valley city police dispatch. With some commercial security companies, a call from their monitoring center doesn’t guarantee the police will go out to your location! We can’t absolutely guarantee it either (property is important but lives are their priority), but our reputation and our long history of cooperation and reliability with the Fresno police department in particular means that our calls are taken seriously and your business is protected. Call us at (559) 486-3466 today for a free, no-obligation security evaluation and quote.